This is a series of four videos that provide a valuable insight into the methods used by Will Allen's Growing Power in Milwaukee. This award winning urban agriculture project is a leader in the use of aquaponics and compost. To the best of my knowledge they are not doing any growing in sub-irrigated planters (SIPs). If they were, it would be an ideal place to conduct valuable testing of compost use in SIPs. We desperately need applied research regarding SIPs that we are not getting from the USDA Extension Program. Growing Power could be a major help in this effort. Yes I am a Costco shopper. This is from a recent Costco newslettter. Of course there are cheaper ways to compost but I thought this was a very cool product and I may buy one for use by CuGreen. I was a pinboy as a kid and spent a lot of time bowling. This looks like a giant bowling ball to me. Watch the video. The CompoMaker was designed in Isreal and of course it is made in China. Does anyone have experience with this composter? This is a designer’s view of a green kitchen that attempts to address a kitchen process from growing plants to composting. It's a good idea but not very practical for mainstream consumer use. The herb-growing planters are not really an advance over clay pots and saucers and it's doubtful that worms are going to become a part of everyday kitchens. Both fresh food growing and composting, however, could be done right now in a user friendly, real-world way. You can easily design your kitchen to integrate an AeroGarden to grow fresh vegetables and a NatureMill to compost the residue. You do not need to be a gardener to use either of them. Just plug them in and with a little bit of help from you, they will do their job. It's only a matter of time that these technologies will become more affordable. It's already happening. Aside from the fact that I took it late in the day with the sun setting, what's wrong with this picture? 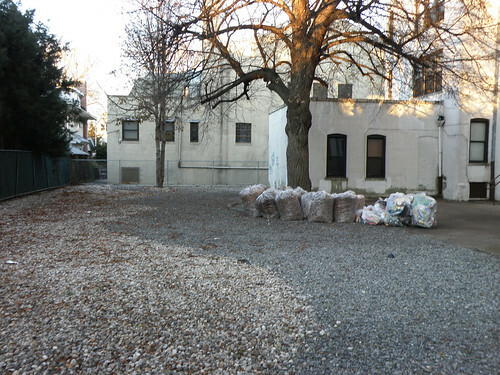 What I see as wrong are those bags of leaves about to go into the city waste stream There is no composting program here in Brooklyn so these leaves will go into the landfill. What if this fenced in space was a sub-irrigated box garden? The leaves could be composted to create a potting mix for the grow boxes. Who would manage the box farm? This area is at the rear of an apartment building. The box farm could be a community project for the building. Or, it could be part of a community garden serving the needs of the immediate neighborhood. The box farm could also be a "server" to distribute boxes to neighbors who would like to grow some vegetables on their own stoop, balcony, driveway or rear yard. The possibilities are endless. What else is wrong with the picture? There are pop bottles in those bags that could easily be repurposed into sub-irrigated pop bottle planters. These could be used for growing starter plants ready to be planted in grow boxes. It's good that the bottles will be recycled but even better if they were reused for a good purpose at no cost. We need to redefine the terms garden and community garden. They are definitely not synonymous with vacant land and turned earth. A city box garden or farm can be located anywhere there is enough sunlight. Just after posting about the NatureMill composter, I found a special "limited time" offer in my inbox today. What they call the NatureMill Classic (original model?) is available online for $199 (+$15 UPS shipping). Read about it here. If you're considering the purchase of a NatureMill indoor composter, there is a post on Boing Boing with many comments worth reading. It certainly seems like a good composting solution for those of us who live in apartments with no space for an outdoor composter. One thing is loud and clear from reading these comments and other reviews is that you must follow the NatureMill instructions. Further, its apparent that if you’re in doubt about anything it's worth the time to read the manual, website information and/or contact a NatureMill customer service rep. The NatureMill kitchen composter may become a significant potting media source for sub-irrigated grow boxes in the future. Have a look at their video. Perhaps a bit pricey but it's a cool kitchen appliance. I'm looking forward to testing it. Here is another urban composter option. It's called an Urban Compost Tumbler. It looks like it would work in a small city yard or even a good size balcony. I have no outdoor space so something like the NatureMill kitchen composter looks like a better option for apartment dwellers like me. The UCT is made by D&P Industries in Oregon. They do business as Urban Garden Center. The composters are evidently made from recycled pickle barrels and may be subject to availability regarding size. Apparently there are two sizes, 7.3 cu. ft. and 9 cu. ft. This composter was featured on Apartment Therapy. This is a NatureMill kitchen composter. I'm seriously considering buying one. At about $300, it is a significant decision in this economy. I do, however, want to start composting kitchen waste. Living in an apartment, an outdoor composter is not an option and I'm not particularly keen on vermiculture. I plan to experiment with the compost in combination with coir and commercial potting mix. I’ll use it for growing and maintaining indoor plants. It will be interesting to see how it performs in recycled pop bottle planters. Unlike conventional opaque pots, they make it very easy to observe what’s going on in the soil system. The compost will also be used to grow vegetables in sub-irrigated grow boxes next spring. Have you had any experience with this composter? Or, do you know someone who has one.